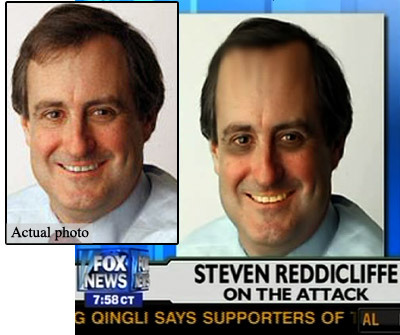 Two years ago, today, Fox News showed their complete lack of ethics and Photoshop skills with these edits of photos of New York Times editor Steven Reddicliffe and reporter Jacques Steinberg. Are you really this stupid? This is simply a distortion from automatically placing an image of one size into a different sized area! Please, wake up from you dillusion. LOL. Nice pick. They both have dirty, yellow teeth, which should be atleast fixed. .-= Kim´s last blog ..Body Building HGH =-. I’ve seen worse. If my memory doesn’t betray me, a quite large german news network removed/photoshoped the teeth of Angela Merkel while she laughed, making her look really ugly and unappealing. Joe, I hope you’re joking. If it were simply from resizing, the entire image(s) would be distorted, not just the forehead, nose, etc., not to mention the darkening around the eyes and yellowing of the teeth. Other aspects of the image(s) are unchanged, which completely makes you ignorant of how this type of thing works… In other words, clever troll is not so clever. …wow, all i can say is wow. Who needs to “wake up from you dillusion”, maybe the right wing nut job who can’t even spell…stop burning the books and try reading them instead. You just may, I say again, may, advance beyond the level of complete moron. joe, clearly you are not familiar with photoshop. as a graphic designer and photographer i am on photoshop cs5 an average of 30 hours a week. 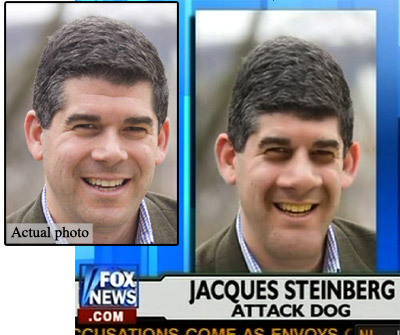 on the steinberg photo alone the fisheye tool was used on his nose, stretch tool was used on his ears, teeth were not discolored, they were completely changed out (count the number of teeth in each photo), chin and head were elongated (likely with a liquify filter or with a pinch/bloat tool), burn tool was used around his cheecks to create shadows hence deeper looking jowels, and the sample tool was used on his hair to lower his hairline (notice his forehead is smaller AND you can see the repeat pattern where the hairs were duplicated in the new area directly below where they were sampled). no joe, this has nothing to do with height/width ratio changing. this was deliberately done and done poorly. hey fox, ill do this gig for you at the same price with far better results. can i start with ann coulter? !